When you really, really want something, it can drive you a little crazy. And so it was in 2014 that the would-be owner of an as yet unbuilt 34 metre Feadship found himself recruiting other clients for the Dutch yard in order to make his long-held dream a reality. 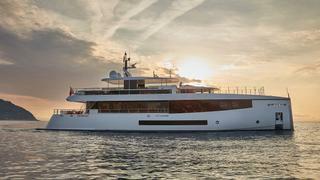 Turning normal practice on its head, then, Feadship agreed to the proposal as long as the would-be superyacht owner introduced two more clients to buy the design. He not only found the two customers, but his design brought in two more. 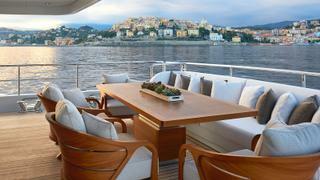 The five yachts are all different, although based on the same hull design and broad configuration. But one stands out in particular. 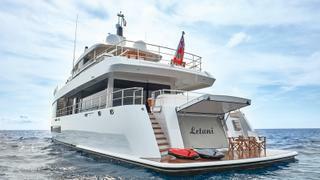 Despite significant modifications compared to the original, Letani, the fourth, set a new record at Feadship for build time. From initial client contact to delivery, her story took just two years to unfold. From the dock at Tarragona, near Barcelona, Letani looks identical to the others in style, with the same crisp lines, low superstructure, acres of glass and towering vertical “axe” bow (designed to make the hull “cut” through waves and therefore more efficient). But, crucially, she is a full metre longer than her sisters. This was a key part of the brief from the client. “We wanted her to feel like a home for us and our two children,” he says. “We all enjoy spending time outside, so it was important that the spaces would allow us to experience the wonders of the Mediterranean climate.” That extra length allows the family to put a couple of deck chairs or loungers out on the swim platform, while the children play in an inflatable swimming pool tethered off the stern. 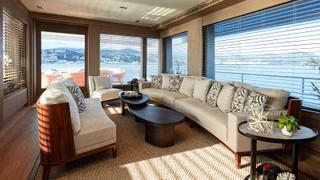 And on the aft deck there is now space for an elegantly curved full-width sofa made by French interior design house Liaigre, as well as a table and armchairs to seat eight in comfort. 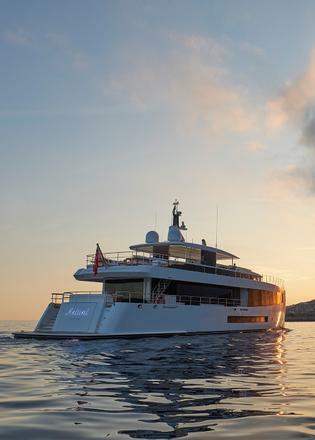 If the near full-length superyacht sundeck is the heart of family living on Letani, with seating, al fresco dining on teak furniture and a relaxing bar area, fun is centred at the stern of the boat. Letani’s garage can house a big 6.2 metre Pascoe tender, using a system of stainless steel frames and rollers to winch it over the bathing platform. “By the end of last season we could do it in about 10 minutes,” first mate Jon Tout says. There’s also plenty of room for a couple of Seabobs, stand-up paddleboards, diving gear and other toys. This owner doesn’t like Jet Skis, but there’s certainly space for them in the roomy garage. 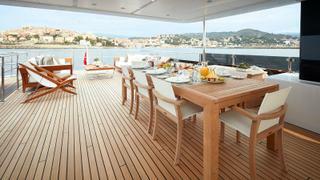 Inside Letani, the interior tells a similar story of family-friendly cruising. 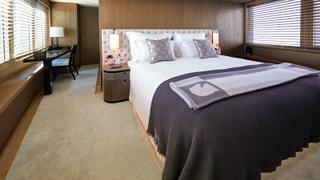 The two smaller cabins on the lower deck, for instance, communicate via a sliding door, and the two single beds in each can be positioned for sleepovers, for lounging or be rearranged as doubles for grown-ups. 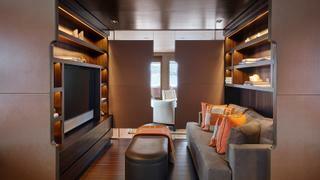 The television shrinks back on an electric strut into a custom-made cabinet of dark smoked oak; facing it across sofas festooned with cushions is a cosy bookcase, which lends the area a private, informal air. The sense is confirmed by the discreet sliding doors that can close off each end, really making this a space for family time. “Our children love the fact they can close the door and watch TV or play games with no parental interference,” says Letani’s owner. There’s still space enough in the bistro-style dining room to seat six at the large table but really this boat is designed for outdoor eating. You might only take to this area if the Med weather lets you down, or for more private conversations. 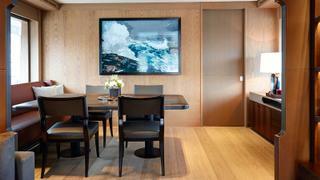 The confidential nature of the room is underlined by a thickly panelled sliding door, which operates automatically. The result is an interior that is muted and refined — a mix of light coloured fabrics, natural leather and wood tones and lots of small decorative pieces, set off by plenty of flowers. 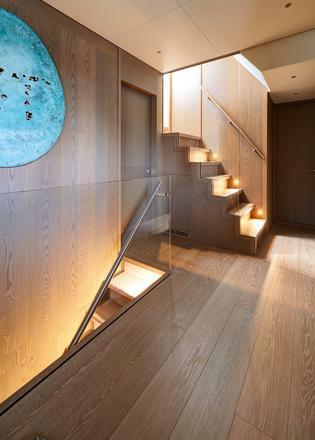 Panels on the walls and bulkheads are smoked eucalyptus, with more deeply smoked and washed oak underfoot, while natural light is used to full advantage thanks to near floor-to-ceiling windows on the main deck and high 2.45 metre ceilings. Don’t imagine that this means “simple”, though. The bathrooms feature Lasa Bianco marble, with the horizontal grain matched all the way round, giving a real sense of scale. 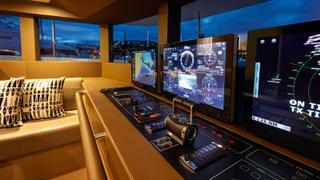 Letani has been exhaustively specced with music and entertainment options, which, along with the lights in each zone of the boat, can be controlled using iPads. The spotless technical space is dominated by twin MTU diesels putting out a combined 3,600hp for 20 knots flat out, with two big 75kW Kohler generators, and a battery of well-considered back-up systems. 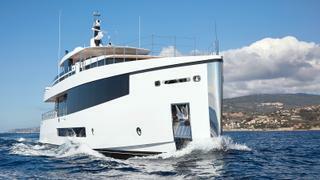 The detail throughout is impressive — and very Feadship. Letani, it turns out, means “flying” in Czech. It could refer to the speed with which the boat was built, or the way the design is flying off the shelves. But from the comfort of one of the boat’s many sofas, with her wide-open vistas of sea and sky, you could be forgiven for thinking that flying is exactly what you are doing. First published in the April 2018 edition of Boat International.